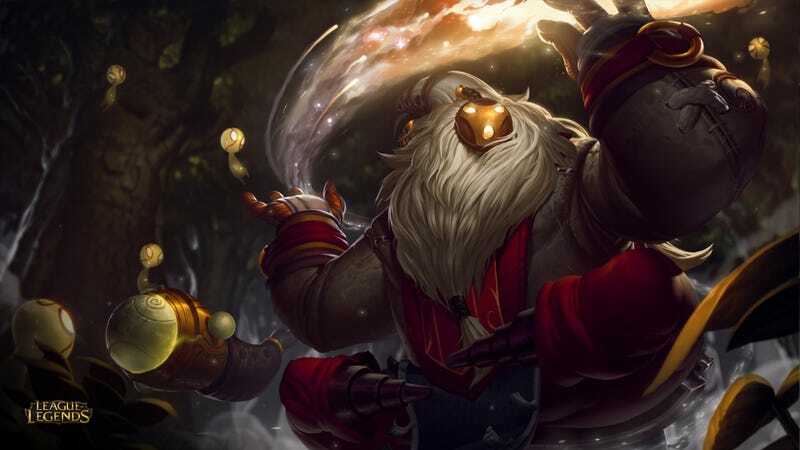 After lots of cryptic teasing League of Legends developer Riot has finally pulled the curtain back for its new champion: "The Bard." He has a big beard, some crazy-sounding teleportation powers, and can summon special little spirit-monsters known as "Meeps." I love him already! Riot's described the new Bard fellow in its announcement Tuesday afternoon as a support character, but one with a twist: he's the first character in the position "to gain advantages solely from moving around Summoner's Rift." One of his abilities, "ancient chimes," drops, well, chimes around the map at regular intervals for the champion to pick up and receive "a brief burst of movement speed, experience, and mana." The idea, then, is that he should be moving around constantly in order to reap the greatest rewards for himself and the rest of the team. "By constantly collecting his unique chimes," Riot continued, "he covers plenty of ground at all stages of a game, and offers his team both solid sustain with his health packs and unrivalled team mobility with his long range portals." The developers said that he should work well in combination with Caitlyn, Udyr, and Amumu. He's weak against Draven, Leona, and Rek'Sai. Even if he is a wandering spirit, Bard first has to identify the best windows of opportunity to roam before he runs off - he can't just abandon his marksman whenever he pleases. By making runs when his lane's pushed or when his marksman has recalled, Bard can successfully roam without placing his teammate in imminent danger, then return to lane by the time he's needed. And while Bard roams around collecting his chimes, he has plenty of tools to support his allies. Laying down a Caretaker's Shrine or two near friendly turrets gives Bard's teammates the sustain to recover lanes that are losing, or overwhelm ones that are winning, and all without the Wandering Caretaker staying in lane. Bard's Magical Journeys cover long distances in specific locations, too, gifting friendly fighters and tanks quick access to the enemy team's jungle, and mages easy access to their own blue buff. The portals needn't propel just Bard and his pals through the jungle, though - coordinating them with allied movement means Bard can quickly move his damage-dealing allies into lane ganks and toward objective control. That said, Magical Journey is best used when his enemies are both seen and distant - they serve little use when enemy assassins simply follow Bard through the portal before claiming lives. Bard offers more than pure sustain and mobility, though, and fires out solid poke whenever he's in lane thanks to Cosmic Binding. Though it deals meaningful damage on its own, the slow (and if procced, stun) give Bard surprising ganking potential, particularly when used in conjunction with Magical Journey. Enemies will have to think twice about escaping through the bottom and top lane brush when Bard can pin them to the nearby wall with a well-placed Q. Once Bard hits six, he gains countless opportunities to secure and protect objectives across Summoner's Rift thanks to the incredible versatility of Tempered Fate. If the enemy team's tower diving a stranded ally, casting the ability over them grants them a few precious seconds of invulnerability while Bard's team comes to the rescue. The ability has offensive uses, too, like freezing a lone enemy while Bard's team closes in for the kill, or freezing an enemy turret while Bard and his allies get to work on diving their suddenly unprotected targets. Teleportation sounds like an interesting asset to have at his disposal. I'm guessing that the champion's...meandering qualities will create some interesting opportunities for high-level players to take advantage of, though they might also end up frustrating people as well. As always, we'll have to see how the guy holds up once he's actually in the game. Whenever Bard attacks, a meep throws itself at his target, dealing extra damage before disappearing back to the spirit world. As Bard collects more chimes, the meeps that follow him grow in both number and power. The Wandering Caretaker has plenty of ways to control areas of the map come mid game. Even if his team arrives late to a dragon attempt, Bard can cast Tempered Fate over the dragon before creating a Magical Journey into the beast's pit. Suddenly what seemed like a simple dragon kill turns into a contested dragon buff and a full-scale teamfight. Here, Bard's role changes to backline utility support. By planting a few Shrines around his team's objective, he gives his team an automatic sustain advantage - allowing his frontline tanks to temporarily pull back to top their health back up, or squishier allies to recover if they get chunked down. Cosmic Binding becomes increasingly useful in tight areas, too - without large spaces to escape to, it's much more likely to tether against a nearby wall or second enemy, stunning both units while Bard's team secure valuable kills. Provided he's collected enough of the chimes through the course of the game, even Bard's meeps offer solid utility, slowing and damaging fleeing enemies once the fight is over. Finally, Magical Journey offers Bard the chance to bring copious amounts of mischief to Summoner's Rift. Baiting the enemy team into following him through a portal before stunning them with Cosmic Binding can bring about a quick and brutal ace, or drag them out of position, letting Bard sacrifice himself as his team emerges elsewhere from the fog of war to tear the enemy's defenses apart. Huh. Portal-based plays sound like the sort of thing that could make for some fascinating gameplay developments in League going forward. I love the idea of tricking League opponents into walking through a portal and straight into a trap. I'm also glad that I won't be able to see what the opposing team has to say about me—assuming I manage to pull off that sort of fake-out.